As is so often the case, market demand has been the key driver in coatings innovation and improved environmental responsibility, says Remy Millott, CEO at GYG. Looking back 25 years, there was little concept – and certainly no enforcement – of environmental protection around refitting superyachts; fundamentally, people could and would discharge almost anything into the sea and atmosphere, from chemicals and dust to liquid and solid waste. This is something we can’t imagine today. Paint coatings were a significant part of this; when commercial ships were painted and antifouled in uncovered dry docks, huge plumes of overspray could be seen drifting up into the atmosphere. The same went for private yachts. How many neighbouring vessels would complain about being covered in overspray? Again, this is something you cannot imagine today. Even in the early 2000s you would see many yachts being painted in-water with sprayers working off pontoons with no covering, causing all manner of environmental problems. Clearly things have changed dramatically and now we are all very aware and respectful of our environmental responsibilities. But what were the catalysts that prompted the changes and how were the technologies behind today’s yacht containment systems developed? As is virtually always the case, it was the carrot and not the stick that sparked the creativity to find solutions to problems that would lead to an improvement in business performance while being less damaging to our planet. In the early noughties, both the number of yachts and their size started to grow rapidly, putting pressure on the limited capacities of the shipyards, both for slipway space and lifting capacity. The Palma-based paint companies, including Pinmar and Rolling Stock, were also feeling this pressure. Both were struggling to paint the larger hulls off floating pontoons or bosuns’ chairs, with the added problems of contamination affecting the paint finish and overspray reaching neighbouring yachts. This, with the addition of interruptions in production due to bad weather, provided a business need to find a solution. The environmental benefits were a necessary by-product but not the primary drivers. Mark Conyers, CEO of Rolling Stock at the time, looked to draw in expertise from the UK construction industry, persuading Peter Martin to set up Andamios (a precursor to Techno Craft) in Palma to introduce construction scaffolding systems and methodologies to superyacht containment. 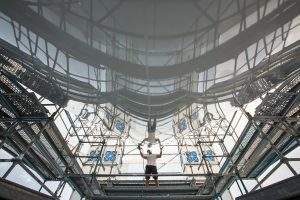 His initial breakthrough came by combining the scaffolding system with shrink-wrap plastic, which had been developed in the packaging sector, to provide a turnkey containment solution. This resulted in a controlled environment in which to work, reducing contamination and environmental issues while also mitigating the climatic interruptions for yachts being hauled out and painted on the hard. Nonetheless, it did not address the shipyard capacity issue of limited lift and hard-standing space. Following this, the real innovation came when Peter was challenged to find a solution to enable in-water painting of large superyachts. Techno Craft utilised its construction-industry experience and engineering expertise to adapt the cantilever system used to distribute tension in suspension bridges, to build a scaffolding system directly off the yacht itself extending all the way down to the waterline. This required major investment in the new lighter and more flexible scaffolding equipment but it was revolutionary as this solution was modular and perfectly adaptable to the larger superyacht. The system effectively became an extension of the yacht structure itself and formed a cocoon-like enclosure, so avoiding the problems caused by the instability of a floating foundation. Techno Craft, Pinmar and Rolling Stock worked in collaboration with a local company called Air Clean to design and introduce filtration and extraction systems to control the quality of the air within the tent and remove contamination and pollutants. These purpose-built extractors use multiple-stage filters incorporating a final-stage, mini-pleat, high-efficiency particle-arrestor system to eliminate the release of overspray into the environment, meaning the negative impact is absolutely minimal and all contaminants are then disposed of in line with ISO 14001. Although Techno Craft is expanding its business to new European territories, the adoption of the cantilever technology has been slow and today its usage is limited to mainly Spanish shipyards; indeed, in the USA, more than 10 years after the Techno Craft breakthrough, yacht-containment companies continue to build scaffold off the floating pontoons, suffering from the inherent problems of instability, sagging and size restrictions. The old adage holds true; if you want innovation, present a problem to an entrepreneur, don’t wait for a legislator.